Be the personification of courage and victory by seeking the blessings of Goddess Durga! She is the empowerment of divine energy who nourishes your body, mind and soul. She is a savior for women as well as a protective refuge for men. Her power rays can increase your courage to achieve victory against enemies. The energy release of the Yantra can quash the efforts of your enemies and bring your own skills to the limelight! Encircle yourself with the positive radiations of Durga and win over your rivals; her unflinching energy assaults all the impediments on your way to success. Your struggles and sufferings can come to an end by prayers to Durga. She destroys all negativity that is blocking joy. The radiations of this Yantra can rebuild your morale and equip you with the qualities that can drive you toward the pinnacle of success. 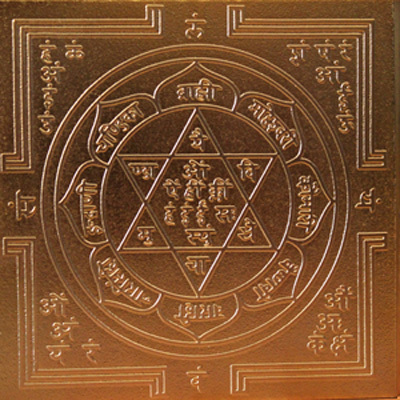 Fulfill every desire you have with the unfaltering energy of the Durga Yantra! • People who are troubled by their enemies. • People who lack confidence and courage to face their future. • People who desire to acquire material comforts. • People who struggle to establish their talents. • People who seek relief from depression or despair. • People who have given up hope.